All is Wells in the Mackenzie Valley! We were met at the Norman Wells airport by Richard Popko of the NWT Department of Resources, Wildlife & Economic Development. After grabbing a quick lunch and dropping off our gear at the Valleyview Apartment, we sussed-out prospective sampling sites within easy driving distance of town. We managed to deploy all our trap sites the following day (Tuesday), and have been busily taking aquatics-, biting fly- and opportunistic collections ever since. Our local contacts have been extraordinarily supportive…. especially Richard and Glen Guthrie. We’re looking forward to connecting with Alasdair Veitch at some point next week! The weather has been unseasonably cool and wet this week, but a warming trend over the next few days should really bring out the insects. We’ve already seen plenty of vertebrates, including black bears and foxes. The former are quite numerous, and two bears were put down this week when they wandered into the heart of downtown Norman Wells. The locals like to remind us that, on one memorable occasion, a black bear entered the very apartment complex we’re staying in, chasing a terrified resident down the hall. Fortunately, the bears we have encountered so far have been well behaved. Tomorrow is a big day as we’re planning to service all our traplines. Hopefully the Canucks/Bruins game doesn’t go into overtime, as we’ll need to start early to get everything done. From the shores of the mighty Mackenzie River, this is Team Wells signing off for now. Our latest profile features Kristen Vinke, M.Sc. student at the University of Prince Edward Island. Kristen is the team leader for our fourth team: “Team Norman”. During my undergraduate degree at the University of Calgary, I became interested in aquatic ecology which lead me to summer jobs and internships involving freshwater science, including stream assessments using aquatic invertebrates. 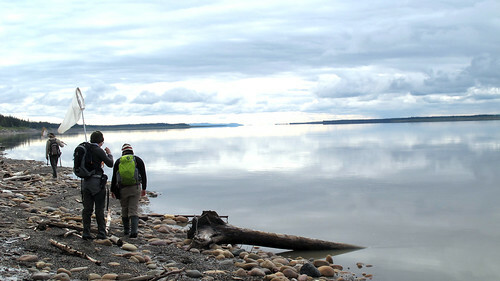 I chose the north for my Master’s because of the intriguing landscape and culture, which I discovered while canoeing the Mackenzie River a few years ago. My Master’s project involved collecting invertebrate larvae from the bottoms of streams and adults along the banks of six streams in the Sahtu area, including two creeks in the town of Norman Wells. A local Dene summer student, Carrie Campbell, assisted with this work. 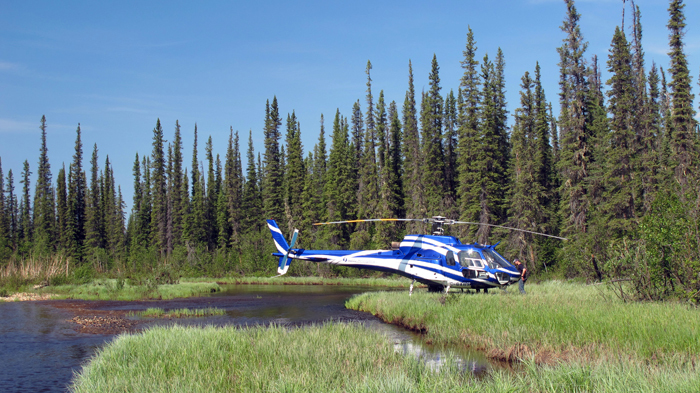 The first objective was to determine whether subarctic stream assessment (using aquatic invertebrates) could be improved by modifying some of the sampling protocols that are commonly used in the south. The subarctic biogeoclimatic features have resulted in unique traits in the aquatic invertebrate community, such as extended diapause and dominance of cold or freeze-tolerant species. These traits result in different species composition, diversity, abundance and life cycle timing, compared to the south. 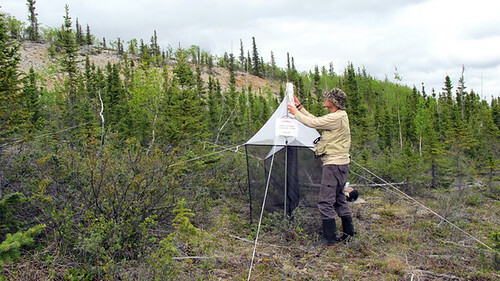 Sampling protocols should be tailored to the unique features of the north if accurate data are to be collected. Therefore I am comparing standard ‘southern’ protocols to modified protocols to see which ones capture the most diversity and are able to distinguish different kinds of streams the best. Additionally, the Sahtu had a biomonitoring program called the Bosworth Biomonitoring project, where local students participated in data collection. However, the program emphasized water chemistry rather than invertebrates, so a high school-level guideline for sampling, processing and analyzing invertebrate data was needed. Using the ‘best protocols’, combined with input from the community, teachers, and students from four of the five Sahtu communities (as well as one community in the Deh Cho area, Ft. Simpson), I developed a stream biomonitoring program that may be used in their science curriculum. The goal is for the students to use these guidelines to annually monitor the health of local streams. 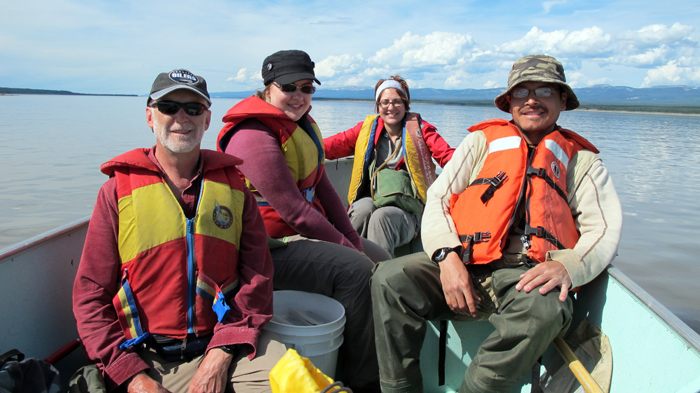 Additionally, the benthic and terrestrial samples from this summer will add to species inventories for the Sahtu area. 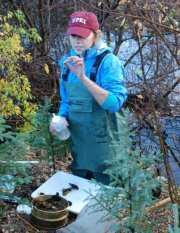 The samples were gathered from a range of stream habitat types to try to capture as much of the diversity as possible.